King of Bitters, scientifically known as Andrographis Paniculata, is a master herb used in 26 different Ayurvedic formulations to treat liver disorders. King of Bitters works to improve liver and gall bladder function, increase bile flow to aid digestion, and can be as effective as Milk Thistle in benefiting liver function when the liver is toxic or under stress. The anti-bacterial and anti-viral benefits may be used to help overcome the symptoms of Hepatitis and boost the immune system to clear infections such as Malaria. King of Bitters triggers fibrinolysis, a process in the body that dissolves blood clots and helps to lower blood pressure. In Ayurvedic medicine it is called "dark cloud" or Kalamegha, and can be Bhui-neem, which means "neem of the ground", because the small herb plant tastes similar to the strong bitter large Neem tree (Azadirachta indica). A third name for King of Bitters is ‘bile of earth’ a Malaysian translation from Hempedu Bumi which also refers to its bitter taste. King of Bitters has for many years been used in Indian tribal medicine, and within traditional Siddha and Ayurvedic systems as well as in clinical medicine in other countries. 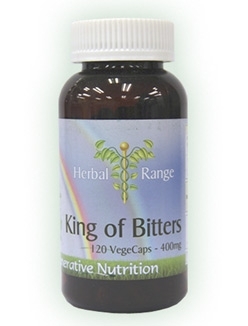 King of Bitters is popular for its effect on enzymes. The Andrographis Paniculata shrub grows well in the moist and shady areas of India and China and across Southeast Asia. Many Chinese households keep Andrographis at home for treatment of digestive complaints and colds. It’s believed that King of Bitters helped to ease the Indian flu epidemic of 1919, and is widely recommended by Scandinavian doctors for treatment for cough, colds and flu in the winter and can sometimes be called the "Indian Echinacea”. Research is also starting to unveil that King of Bitters may also be important for cardiovascular treatment and cancer treatments. Please read the other tabs of this page for more information on introducing King of Bitters into your diet, advice and research for King of Bitters. A potent anti-inflammatory, anti-bacterial and anti-viral effects. In addition, scientists have discovered that Andrographis paniculata helps boost the immune system, protects against cancer, prevents blood clots and maintains efficient digestive functioning. Useful in upper respiratory infections, fever, sore throat and herpes. Other reported applications include its use in cases of malaria, dysentery and even snakebites. The main active constituent in andrographis is andrographolide, which in herbal medicine is referred to as a 'bitter' principle - so called because of its bitter taste. Indeed, andrographis is known as the 'King of Bitters'. Bitter herbs generally have an affinity with the heart, liver and gall bladder and most have a cooling effect on the body and can bring down a temperature. Andrographis paniculata (AKA Indian Echinachea) is one of the most commonly used medicinal herbs in traditional Indian medicine, or Ayurveda, and also in Chinese herbalism. The plant is an annual in India and grows to between 1 and 3 feet tall. This versatile herb has been used to treat a wide variety of health conditions, some of which have been substantiated by scientific research. Andrographis and its various components have demonstrated a variety of effects in the body. Aspects stimulate the general immune activities, others inhibit the body's inflammatory mechanism and still others demonstrate not only anti-microbial abilities, but also are instrumental in killing certain tumor cells. Studies have also indicated that the active chemical, Andrographolide, helps to stop the clumping of blood platelets which is the clotting process that can lead to heart attacks. King of Bitters is also reported to possess antihepatotoxic, antibiotic, antimalarial, antihepatitic, antithrombogenic, antiinflammatory, anti-snake venom, and antipyretic properties to mention a few, besides its general use as an immunostimulant agent. The suggested dosage for andrographis is 400mg - 800mg twice a day (for up to 10 days). Although andrographis has been found to be safe in humans, animal studies suggest it may impair fertility. Safety in young children and pregnant or nursing women has not yet been established. As a preventative for the common cold, studies show that andrographis may increase the body's resistance to infection by stimulating the production of antibodies and macrophages - large white blood cells that scavenge foreign matter. To date, the herb is best known in Western society as a popular over-the-counter alternative remedy for the common cold. Several double-blind clinical trials have shown that andrographis can reduce the severity of symptoms. In one study involving 158 participants, andrographis or placebo was given daily for 4 days. By the second day those taking the herb showed significant improvements as compared to those given the placebo. Improvements were seen in relation to sleeplessness, nasal drainage and sore throat. In a three-month trial involving 107 students, 54 of the participants took 100mg of andrographis twice daily, while the remaining students were given placebo. At the end of the trial only 16 students in the andrographis group experienced the signs of a cold, compared to 33 in the placebo group. In one Chilean study, the herb had a significant drying effect on the nasal secretions of cold sufferers who took 1,200 milligrams of andrographis extract daily for five days. A systematic review of the literature and meta-analysis of randomized controlled trials also suggested the herb alone or in combination with eleuthero may be an appropriate alternative treatment of uncomplicated acute upper respiratory tract infection. Andrographis promotes a healthy heart by preventing blocked arteries and blood clots. According to studies in China, andrographis is effective in preventing the formation of blood clots. Further research shows that the herb activates fibrinolysis, a natural process in the body in which blood clots are dissolved. It also relaxes the smooth muscle in the walls of blood vessels and has a blood pressure-lowering effect. Scientists today are focusing on the herb's application in treating the 'killer' diseases that blight modern life, such as heart disease and cancer. Andrographis extracts are cytotoxic (cell-killing) against cancer cells. Positive results have been seen in relation to stomach, skin, prostate and breast cancer cells in test-tube studies. In fact, recent laboratory tests in New York have demonstrated that andrographis may inhibit the growth of human breast cancer cells just as well as the drug tamoxifen. A study has been conducted on the cellular processes and targets modulated by andrographolide treatment in human cancer and immune cells. Andrographolide treatment inhibited the in vitro proliferation of different tumor cell lines, representing various types of cancers. The compound exerts direct anticancer activity on cancer cells by cell cycle arrest at G0/G1 phase through induction of cell cycle inhibitory protein and decreased expression of cyclin dependent kinase 4 (CDK4) Immunostimulatory activity of andrographolide is evidenced by increased proliferation of lymphocytes and production of interleukin. Andrographolide also enhanced the tumor necrosis factor a production and CD marker expression, resulting in increased cytotoxic activity of lymphocytes against cancer cells, which may contribute for its indirect anticancer activity. The in vivo anticancer activity of the compound is further substantiated against B16F0 melanoma syngenic and HT 29 xenograft models. These results suggest that andrographolide is an interesting pharmacophore with anticancer and immunomodulatory activities and hence has the potential for being developed as a cancer therapeutic agent. Further, Andrographolide could be developed as a therapeutic agent to treat both androgen-stimulated and castration-resistant prostate cancer. Andrographis has been shown to be a safe traditional botanical for supporting upper respiratory tract health, per analysis of seven double-blind controlled trials. The herb has been shown to inhibit RANTES secretion in inflamed bronchial cells. RANTES is a chemoattractant for eosinophils, monocytes and lymphocytes that are stored in, and released by, platelets and activated T-cells. In related research: Andrographolide, an active ingredient in Andrographis, has been shown to be responsible for the herb's inflammatory modulating actions, including the reduction of cytokine and peritoneal deposition of neutrophils, and modulation of lung inflammation in vivo. Extracts of Andrographis exhibit potent inflammatory modulating and antioxidant actions in mouse models. Andrographis paniculata is recognized for its purported blood-purifying properties and has been used in traditional Asian medicine to treat conditions believed to be related to impurities in the blood, such as boils, scabies and other skin conditions. Andrographolide, an active ingredient in Andrographis, has been shown to be responsible for the herb's anti-inflammatory actions, so easing chronic fevers according to Shahid Akbar, M.D., Ph.D, writing for the 2011 issue of the journal "Alternative Medical Review." Andrographolide and two related compounds showed antiviral properties against herpes virus in a study conducted by the Faculty of Pharmaceutical Sciences, Khon Kaen University, Thailand. All three were less than 50 percent effective at preventing infection with the virus. However, one of the compounds totally inhibited the virus after infection was established and another was moderately effective at inhibiting the virus post-infection. The compound that exerted complete inhibition of the virus stopped the virus in its early phases of replication. The study was published in the May 2011 issue of the journal "Medicinal Chemistry." Andrographis Paniculata is used widely to treat fevers like chiken-guinea flu (bird flu), swine-flu, typhoid etc. Andrographis paniculata may be useful for treatment of asthma, according to a study conducted at the Department of Pharmacology, Yong Loo Lin School of Medicine, Singapore. In the tissue culture and laboratory animal study, a derivative of andrographolide decreased levels of eosinophils, a type of white blood cell that is triggered in asthma, and antibodies. Andrographolide is an active constituent of Andrographis. Mucus production, histamine levels, proinflammatory molecules and airway irritation were all reduced. The derivative compound was safer than andrographolide, itself, which is known to have toxic effects. The study appeared in the May 2011 issue of the "Journal of Natural Products." A recent, 2011, randomised, double-blind, multicentre,study found Andrographis paniculata as effective as mesalazine (mesalamine) in the treatment of ulcerative colitis. Colds, Flu, Sinusitis: Andrographis compounds have shown antivirus properties which appear to inhibit glycoprotein's in the virus. This impedes the viruses ability to invade cells in the body and replicate. It's andrographolide are currently being studied for the antiviral effects they have on avian bird flu virus and the ebola virus. It also has a major effect activating the general defense functions of the immune system by stimulating the production of antibodies as well as non-specific immune responses such as increased macrophage phagocytosis, rather than by any direct anti-microbial activity. Clinical studies have demonstrated it's efficacy fighting colds, flu, sinusitis, pharyngotonsillitis, familial mediterranean fever and upper respiratory tract infections. It also has been demonstrated to reduce the risk of colds and prevent flu and complications when used as a preventative. Anti-inflammatory: There appears to be a significant presence of flavanoids in the Andrographis Paniculata herb, which always have an anti-inflammatory affect. In vitro studies have shown that the flavinoid activities supressed the genetic expression of neutrofils, an inflammatory agent. Similarly, studies have indicated that a variety of inflammatory proteins, including COX-2, are reduced by the presence of Andrographoloid. Anti-tumor: In vitro andrographolide studies indicate an immuno-stimulating activity as well as a marked inhibitory effect. Its presence increases proliferation of lymphocytes and production of interleukin2, TNF-alpha production and cytotoxic activity of lymphocytes against certain cancer cell lines, as well as demonstrating potential direct anti-cancer activity by the induction of cell-cycle inhibitory protein p27 and decreased expression of cyclin-dependent kinase. A study conducted at Bastyr University, showed a significant rise in the mean CD4 lymphocyte level of HIV subjects after administration of 10mg/kg andrographolide. Side Effects & Safety: Andrographis Paniculata has been widely tested and is considered safe with few if any minor side effects at commonly prescribed levels. In clinical trials with children between 4 and 11 Andrographis was effective and safe. Side effects occurred in HIV trials at a dose of 10 mg of andrographolides per kg of body weight or roughly 12 time the recommended dosage. Pregnant women or those trying to conceive should avoid Andrographis. Animal studies have shown the possibility of contraceptive effects at high dosage levels. Safety during breast feeding is not known. Andrographis may increase glucose metabolisation which could unduly enhance blood sugar lowering medication. 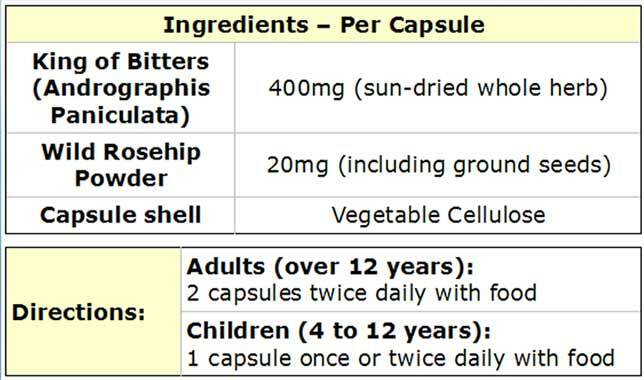 Use cautiously if taking anticoagulant agents such as warfarin (Coumadin®) or heparin, or with anti-platelet agents such as ibuprofen (Motrin®, Advil®) due to possible platelet aggregation inhibition by Andrographis.